This photo was sent to me by Javed Iqbal. 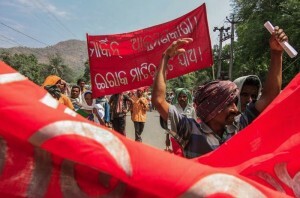 The May Day protest shown was in Balimela in Malkangiri district in the Indian state of Odisha. Over 3000 people marched demanding political rights & protesting state oppression. This banner is against the US war in Iraq. Reviews are in from the Cannes Film Festival of director Sean Penn’s “The Last Face” starring Charlize Theron & Javier Bardem. You can tell from their faces here at the press conference that things did not go well for the film which was greeted at the festival with derisive laughter & booing. The film was mocked & pilloried by reviewers as white savior genre so despicable & artistically bereft it became camp & so racist it had no meaningful role for Africans except as pitiable backdrops to two white people getting it on. It is considered a major disaster, a cinematic nightmare by all reviewers. A film bombing out is not news. What is interesting about this film bombing out so ignominiously is Sean Penn’s political role as a white savior in Haiti after the 2010 earthquake. He marched into Haiti playing the great white knight in tow with Bill Clinton (who was stealing the country blind from millions donated for relief), Hillary Clinton as US Secretary of State, former Haitian dictator Jean-Claude Duvalier, & Haitian president & former death squad member Michel Martelly. Penn used his celebrity & liberal reputation shamefully to facilitate their criminal efforts to take advantage of the earthquake to turn Haiti into a sweatshop haven–& to repress political opposition to those schemes. Penn has been feted from here to Kingdom Come for his so-called humanitarian work in Haiti when he is nothing but a low-level sniveling shill for sweatshops & white supremacy. This tawdry white supremacist film bombing out serves one purpose very well & that is to expose the racist posturing of Sean Penn. May he fry in hell for all eternity for his crimes against the people of Haiti. 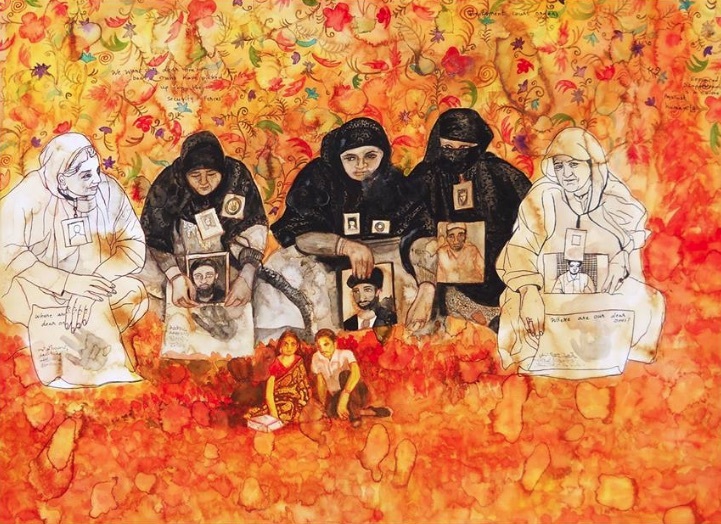 This beautiful drawing by Rollie Mukherjee shows Kashmiri women protesting the disappearance of their children. It’s posted as a tribute to their work & to stand in solidarity with them.